Absolute Path, is a path that points to the same location on file system regardless of the working directory or combined paths and usually written in reference to root directory. Relative Path, is a path that relative to working directory. In many ways, absolute path is much usefull because it doesn’t need us to redefine the path or link if we change the working directory. 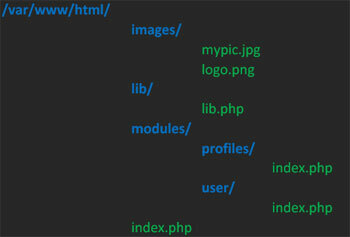 For an example, below is a directory hierarchy of a web application that located on a development server that can be accessd via url www.mysite.com, where /var/www/html is it’s web server’s document root and application root directory and ‘/’ is the application root url. Using absolute path, it wouldn’t be a matter where the working directory is, but it would be a problem if you change the application root directory into another directory other than web server’s document root, for example in /var/www/html/web, so your application would be accesed via www.mysite.com/web. We have to edit manually each file that using absolute path because the root directory will changed to /var/www/html/web so the included file will not work. To overcome this problem, you have to define a global variable that specified absolute path that generally applied to all directories in your application. The solution is to define two variables which will be used to define root directory for file operations and root url for url operations in a file that would be placed in the root directory . As you can see, it will be applied in any directories regardless where the current working directory or server document root. /var/www/html/web/images, notice that images is also subdirectory like sub-web. How do you define the path? define a constant ROOT_DIR : define(‘ROOT_DIR’, dirname(__FILE__)); and save it on a file (ex: root.php) in /var/www/html/web. If you want to upload files to /var/www/html/web/images from your sub-web directory, just include the root.php and ur upload path would be ROOT_DIR . ‘/images’. Thanks Lorenz. Just what I needed! Thanks for posting. The requested URL /home/misterge/domains/mister.ge/public_html/index.php was not found on this server. Can i fix this thing with this? Thanks mate, this is what I am finding since last two hours, can you also tell me is it after implementing this, is it necessary to use set_include_path and get_include_path function, I am not sure about this, please help. I try writing a PHP code to save data to my MySQL database and to save my image to the folder created in my htdocs but nothing is happening. Image folder directory (“image/$image”) where image is the name of the folder and $image is the variable name holding my values. Please I want you to help me out.